新年快乐! Happy Chinese New Year everyone! It’s my 3rd year spending Chinese New Year away from home and I’m actually missing all the goodies (but not missing the constant questions about my life from aunt and uncles). Despite being away, I’m fortunate and glad to be spending Chinese New Year with my friends from the Singapore Society! Though it was my last celebration here, I definitely had fun and caught up with friends whom I’ve never seen in a long time! 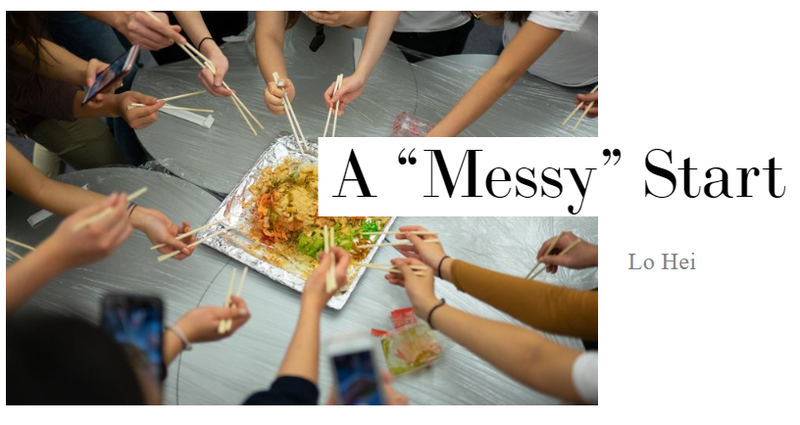 We started off our Chinese New Year celebrations with the traditional “Lo Hei” where it gets extremely messy and chaotic but its fun! 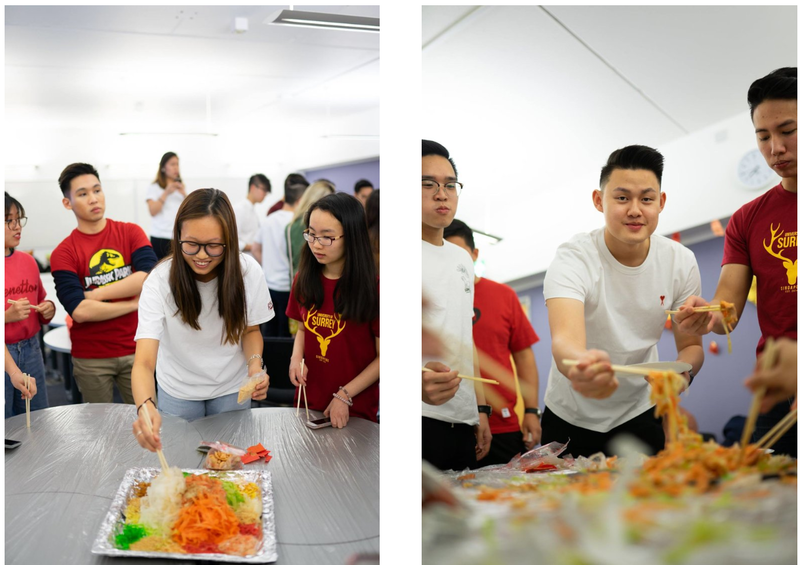 For those who do not know what is Lo Hei – “Lo Hei” in Cantonese, where 捞 “lo” (literally mixing) means “tossing up good fortune”, refers to the ritual adopted in Singapore of tossing the yu sheng and saying of auspicious phrases before eating it. The dishes are prepared separately and added to plate accordingly while reading phrases that signify its “importance”. Read more about it here. Thankfully, despite the chaotic mess, I did managed to get some photos and also a plate of Yu Sheng. After tossing Yu Sheng, we were greeted by a variety of gastronomic home-cooked delicacies made by “chefs” of Singapore Society! You know who you are! Ranging from, Chicken Rice to Tangyuan, our guests definitely have a plethora of options to choose from. At the end, literally everything was wiped clean! 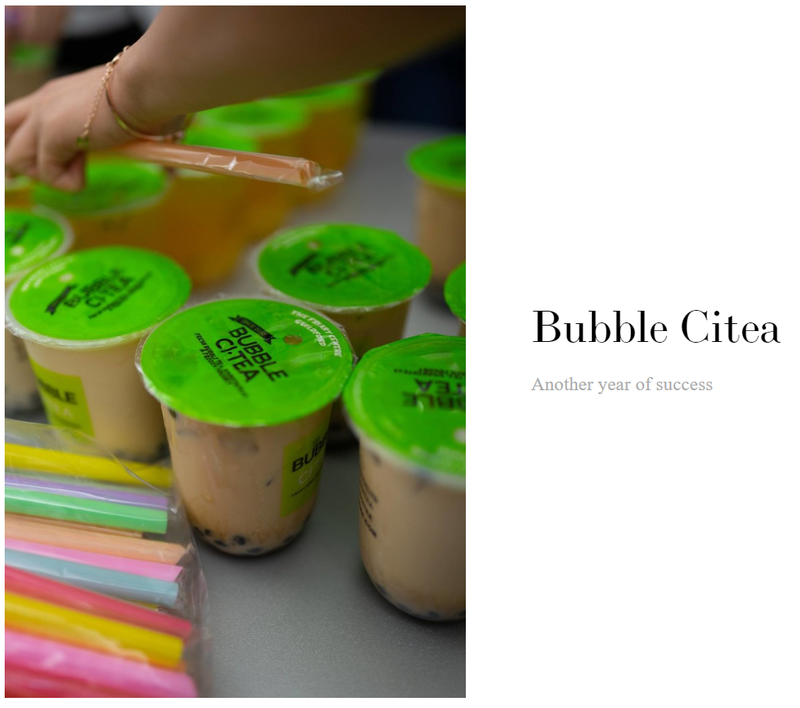 Big shoutout to our partners Bubble Citea for another year of successful collaboration and sponsorship of bubbletea which our members love so much. Singapore Pools for the sponsorship of our society T-shirts which our members wear during events! 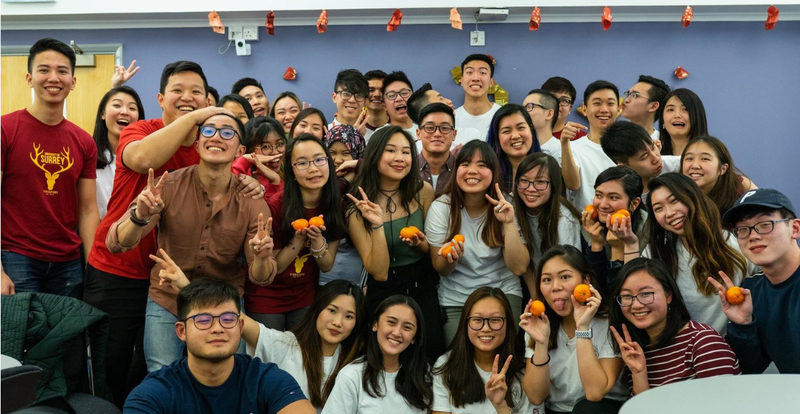 With the successful collaborations, Singapore Society has grown over the years and we hope that it will last for the long-run! We ended off the night high with a series of games and movie Just Follow Law, a famous Singaporean movie shot in the past. 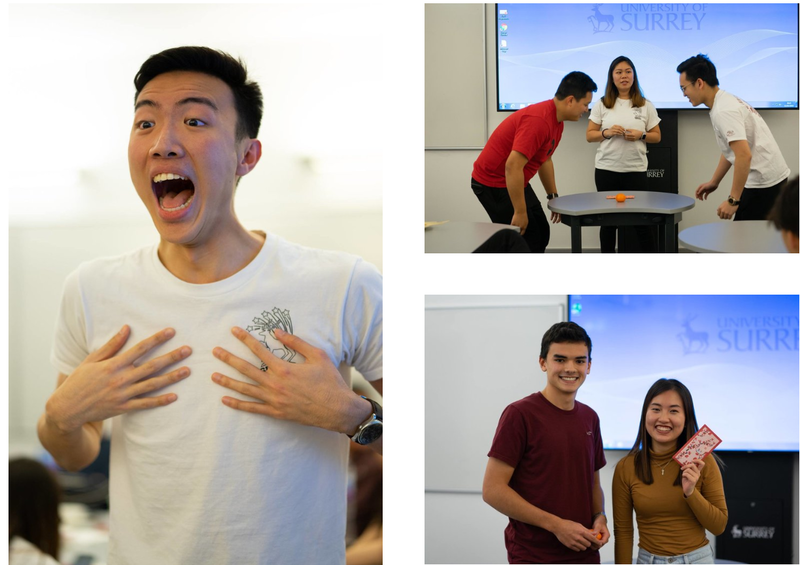 Everyone had their share of fun and laughter and actually getting gifts at the end of the game! And that’s all I have! 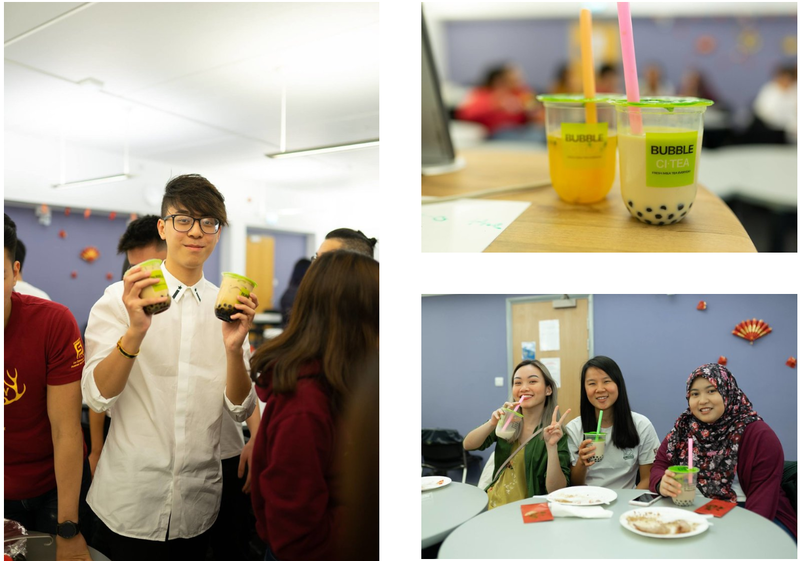 It was a great night celebrating Chinese New Year with new and old friends here at Surrey! Next year, I’ll be back in Singapore indulging in CNY goodies and be bombarded with life questions from family members again. Great. Hope you enjoyed today’s post! Stay tuned to Dwayne’s post on Wednesday where he will share his experience with his Direct Entry university application! Wishing you and your family a year full of health and abundance! Happy Chinese New Year!